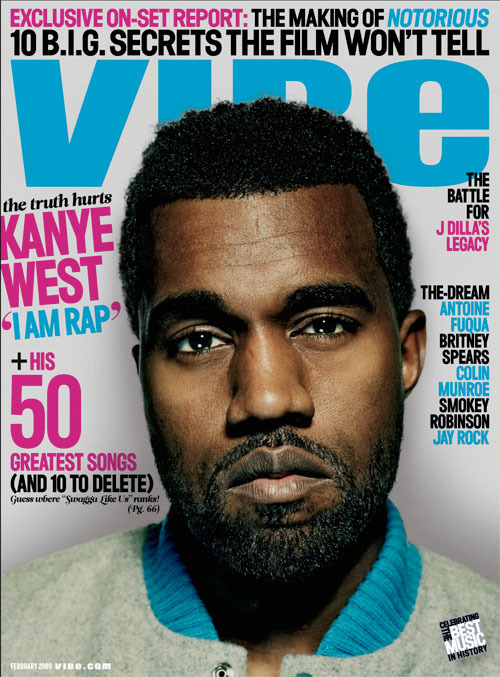 Kanye West makes the cover of the February issue of Vibe Magazine. I haven’t done anything violent. They make it seem like I actually went and hit the paparazzi. I haven’t. I was restrained. I’m good at restraining myself from committing violent acts. I know how to control my temper. That one paparazzo made it a bigger deal. I just put my hand up and he felt like he had more right to my personal space than I did. I put my hand up to stop him from shooting me. I do think it’s my best album to date. No, I actually know this is my best album to date. Do I think it will be my best album ever? No, Ill improve. Do I think there are mistakes in it? Yes. There has to be. I’m a human being. But I think it surpasses Graduation. These 12 tracks are going to resonate more than any 12 tracks of any album this year. Previous post: Obama’s Old Chrysler 300 Is Sold On eBay? ?